The very bright streak is Jupiter traversing the sky, it's a great time to look for our solar system's biggest planet! And don't miss the Perseid Meteor Shower ( http://science.nasa.gov/headlines/y2008/22jul_perseiddawn.htm?list937934 ) right around the corner peaking Aug. 12th, it should be a good year for it! 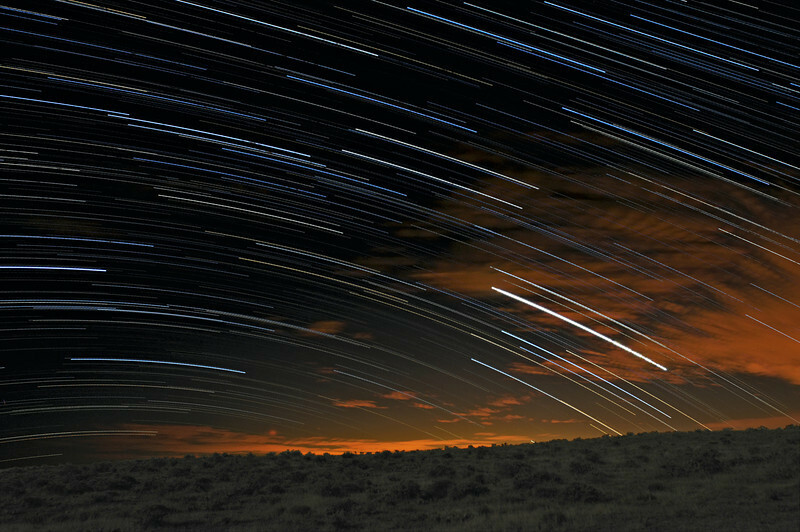 This is one of my first stacked star trail images, usually in the past I used slide film or used 15-30 min exposures. For this image, 62 1 min 11 sec exposures 1 sec apart were combined with this free Photoshop action ( http://www.schursastrophotography.com/software/photoshop/startrails.html ) . Others you might want to try, especially if you need a stand alone if you don't have PS are here ( http://www.startrails.de/html/software.html ) and here ( http://deepskystacker.free.fr/english/index.html ) . Enjoy!